Ice cream made with 18th century chocolate! There are only a few more official days of summer left, so I’m going to use them to their best advantage by devouring as much ice cream as possible. But chocolate or vanilla? A very important question. According to the International Ice Cream Association, 30% of ice cream eaters prefer vanilla, while a mere 10% prefer chocolate. But more important important to me is the question: which flavor came first, chocolate or vanilla? Some of the earliest frozen desserts were scoops of snow or shaved ice topped with flavored sugar syrups; sometimes, these were made into icy drinks. In the Middle East they were known as sharbates or serbets–the origin of the words sorbet and sherbet. Drinking Chocolate making tools: a pot and mixing device. From Lady Anne Fanshawe’s journal, c. 1665. Because of the precedent of frozen drinks, some of the earliest ice cream flavors were drinks, like coffee and tea. Which is why chocolate ice cream was invented long before vanilla. The first frozen chocolate recipe was published in Naples, Italy in 1692 in the book The Modern Steward. “Chocolate” was popular hot drink in 17th century Europe, and was commonly mixed with spices like cinnamon, chili peppers, anise, almonds or musk (glandular extracts from the musk deer (eww)). Today’s “Mexican Chocolate” is actually a descendant of how chocolate was served in the Spanish court, not how it was served by the ancient peoples of Mexico. The Historic Division of Mars make a historic chocolate based of an authentic 18th century recipe. It looks like a chocolate crayon, and is blended with anise, red pepper, nutmeg, orange zest, and cinnamon. I decided to make a version of the original chocolate using a basic ice cream recipe and half a cup of grated historic chocolate. 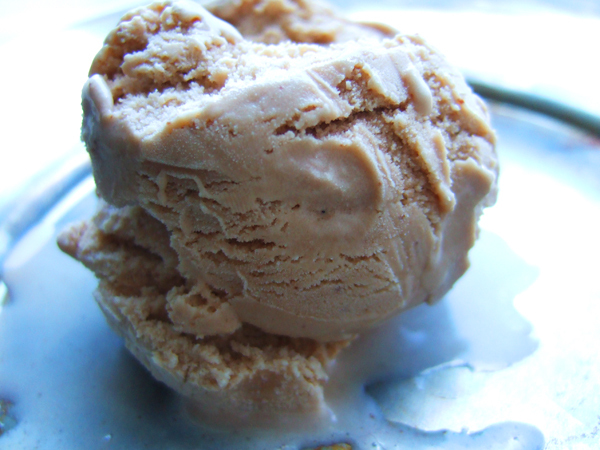 Before the 19th century, ice cream was made using only cream, but I think that gives it a borderline buttery texture. I like a 2:1 ratio of cream and whole milk. As the cream and chocolate froze in my modern ice cream maker, the rotated action of the dasher release the oils of the ground spices, and made my kitchen extremely fragrant. Homemade ice cream is supposed to freeze once in the ice cream maker, and then it should go into the freezer, to become hard-packed ice cream. I stole my first taste of historic chocolate ice cream off the dasher as it came out of the ice cream maker: it tasted just like a Mc Donald’s chocolate milkshake, which was super weird. Or at least how I remember them tasting–I haven’t had one since middle school, when my mom would always buy me one as a treat after visits to the orthodontist. I tasted the ice cream after it was fully frozen a few hours later: the chocolate wasn’t the prominent taste. Instead, all the warm spices the chocolate was blended with where in the forefront. Anise was the most pronounced, but without leaving a liquorice aftertaste. If you’re interesting in trying this recipe out, you can buy historic chocolate here. It’s also great hot with lots of cream and sugar. Next up: Vanilla! How America’s favorite ice cream came to be. Much of the research for this article came from Of Sugar and Snow: A History of Ice Cream Making. Learn more about this book here! For a history of drinking chocolate, check out A History of the World in Six Glasses here. I so regret not making ice cream when I had a milk cow…. That would be some rich ice cream! I’ve always wanted to try a syllabub. It’s a dessert drink with wine, and some recipes call for you to milk a cow directly into your punch bowl!